I have owned this boat for 2 years, the first year we enjoyed trips along the canal and stayed on the boat for numerous weekends. this past year i have spent improving and adding to the boat, with the following:Replaced the back awning cover for fixed perspex windows doors and roof, to enhance the rear sitting area. Added blue striped sitting. Renewed water tank, all pipes , 12v water pump and sink tap. Added 230 battery, along with 2×100 w solar panels, 40A MPPT charge controller and remote unit. Added 3000v pure sine wave power inverter. Installed new Fox hunter cast iron multi fuel 5.5 kw log burning stove with double lined flue and vermiculite fire boards surrounding. Inside the boat- gas oven, grill and 2 rings, water heater (not working), seating, bed area, cupboard and draw units, sink —— part potty excellence, placed under unused seat area, 24” full HD slim led TV with freeview and DVD player, and ariel off boat roof.After using and then adding the above items, I unfortunately no longer have time for the boat, so decided to sell.In my opinion, a nice boat that could do with some bits finishing off, however a new owner would like, could do with exterior paint job, but never really bothered me.My original sales details list:1984 Dawncraft, Length: 25’Beam: 8’6”Draft: 2’BSS to september 2018Volvo MD11c (23 hp)inboard diesel engine, oil changed recently, however boat wasn’t moved much during winter and now could do with service. Despite recent oil change ( 2 months ago), oil levels are rising, which indicates there is a leak in fuel connection. Engine will start with “cold start”, however I’m not mechanic so its difficult to establish what is the reason. Was quoted £400 for repair by mechanic. Moored not far from Frampton on Severn, near Gloucester, any questions please message me here.Viewing recommended at arranged day and time. Also, advertised elsewhere, so may widow at any time. 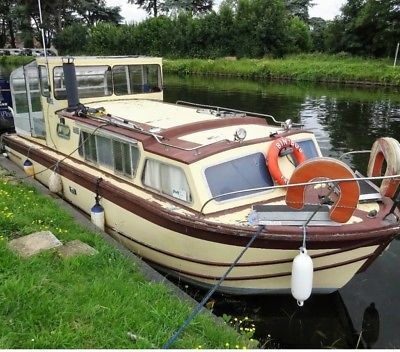 This Dawncraft 25” Motorboat Canal Boat boat is located in Gloucester, GL2 7ez and is being sold on eBay by whitebrightsmile.